Up to 20 cm tall. An attractive hairy perennial. Leaves are basal, kidney-shaped and hairy with blunt teeth. Small brown bulbils are produced at leaf bases in autumn and give rise to new plants. 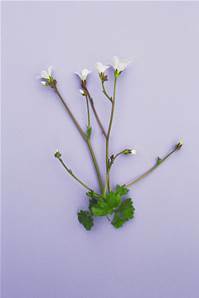 Flowers are 20-30 mm across and five white petals April to May.